The Obama administration claims it was legal to take action against ISIS under the authorization for use of military force passed after 9/11, and the 2002 authorization for the Iraq War. 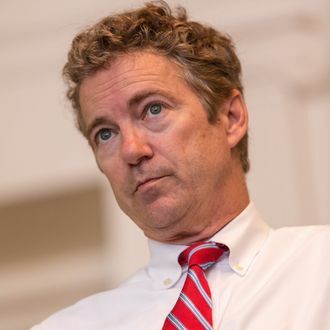 Paul’s proposal would repeal the 2002 authorization and keep the 2001 authorization, but limit the military action against ISIS to just one year. He would also restrict the use of ground troops to specific circumstances, like killing high-profile targets. Congress has not declared war since World War II, relying instead on authorizations for the use of force. As the Congressional Research Service explains, the former would automatically give the president broad wartime powers, while the latter would not. Paul probably won’t get Congress to ignore the precedents for authorizing military action set over the past 70 years, but “declaring war” on ISIS is definitely more attention-grabbing.